After reading The Orenda, I promised myself I would read some other First Nations authors and the two I picked were Thomas King and Richard Wagamese. Recently, hearing a CBC The Next Chapter podcast about Richard Wagamese’s new novel ‘Medicine Walk’, I decided to start with it because I was so touched by Wagamese’s personal story. In a candid interview with Shelagh Rogers, Wagamese is very open about the fact that because he is an alcoholic, he became alienated from his sons. Those years are lost and he is trying to find healing in his personal life. Part of how he does this is through his writing. 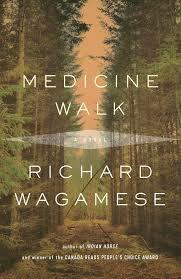 Medicine Walk is a beautifully written and moving story about a father and son. It is as lyrically and respectfully written as Boyden’s epic work, just as powerful, but simpler and gentler. Wagamese’s earlier novel Indian Horse, winner of the Canada Reads People’s Choice poll in 2013, is now definitely on my to-read list as well. It’s about residential schools and how one boy finds hope through playing ice hockey. This entry was posted in Fiction, Five Star and tagged Canada, First Nations, Medicine Walk, Richard Wagamese. Bookmark the permalink. Wish I had time to read fiction. Sigh. But someday, when I have time, I’ll know where to go.